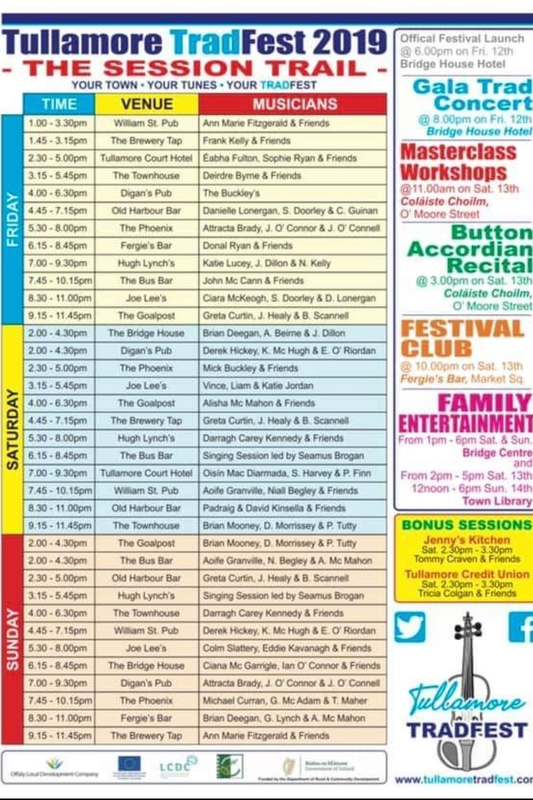 Music and craic lovers from Offaly and beyond are been invited to the brand new Tullamore TradFest, a traditional Irish music festival to be held in Tullamore on the weekend of April 12 to April 14. Tullamore TradFest intends to flood Tullamore with traditional Irish music on these dates, sharing the rich traditional music heritage that County Offaly possesses. attractions Tullamore and indeed County Offaly has to offer. Our ultimate goal is to create an annual TradFest for Tullamore which will grow over the years and lead to a sustained interest in the genre, and over the next few years, place the town firmly on the traditional Irish music map," chairperson Tommy Craven said. "We have set our sights high and plan to bring a mixture of the very best internationally, nationally and locally acclaimed musicians to Tullamore to perform in concerts, sessions, recitals and workshops on the dates in question." “We have been overwhelmed with the huge positivity that Tullamore TradFest has been received with. We have 16 venues in Tullamore signed up to our Session Trail, more than double what we expected when we had our initial committee meeting." as far away as Switzerland and New Zealand with people telling us that they will be coming to Tullamore TradFest as part of their annual holiday home to Ireland." "This is a huge opportunity for Tullamore to place itself on the Irish festival scene and build an annual event. We as a committee in association with our various partners such as the local vintners, local media and our generous supporters and sponsors have put huge effort into organising a massive programme of events." the event. With two concerts, instrument workshops, over 50 free sessions and free family entertainment there really is something for everyone," Tommy concluded. Find out more at www.tullamoretradfest.com or by following Tullamore TradFest on Facebook, @tmoretradfest on Twitter or @tullamoretradfest on Instagram. - Tullamore TradFest Main Concert featuring, Bríd Harper, Darren Breslin & Brian McGrath, Aoife &amp; Deirdre Granville and many more guest artists. Venue: Bridge House Tullamore @ 8pm. Admission €15 – tickets available from Bridge House Reception or www.tullamoretradfest.com. - Tullamore TradFest Accordion Recital Venue: Coláiste Choilm @ 3:30pm. Admission €5. - Tullamore TradFest Festival Club featuring, Damien Mullane & Eugene Quinn supported by Splendid Isolation (Ciaran Cooney, Michael Buckley, Sean Bourke) Venue: Fergie’s Bar, Market Square @ 9:30pm. Admission €10 – tickets available from www.tullamoretradfest.com.